Who is God? What is He like? How can I find out about God? Has anyone ever seen God? the best things for our life. Why wouldn't everybody want that? 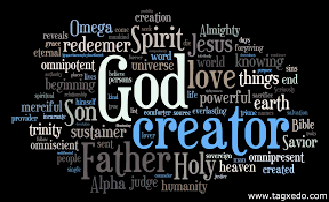 Here are a few scriptures that show us what God is like. to made a decision as to whether we believe God or man. regarding what they believe about the creation of the heavens and earth. wrong, upright and just is he. always get a square deal with God. He is not like man that says one thing and does another. You can trust God because he will always do what he says he will do. What this shows us is that God who created us, could wipe us out in an instant if he wanted to. that we are totally dependant on God for our life whether we like to think so or not. we can trust that if God said something....you can be sure it will happen. I love those who love me, and those that seek me find me. choice, God won't chose for you. live and move and have our being. This pretty much sums up what has been said up till now, but there are some key points here. and who lives in unapproachable light whom no one has seen or can see. spirit body and live in Heaven with God. Then they can talk with God face to face. will know what God is like. could be forgiven and spend eternity with God in Heaven. forgiven. Then we can have a relationship with a Holy God. learn more about who God is, and who you are.